In the months before helping the USA qualify for the 2017 U-17 World Cup, striker Andrew Carleton and Christopher Goslin played their soccer with men. Both had signed Homegrown contracts with MLS’s Atlanta United last year and left the U-17 Residency Program in Bradenton, Florida, to train under Coach Tata Martino. “They’re playing against seasoned pros like Michael Parkhurst, Kenwyne Jones, Miguel Almiron ...” says Atlanta United Academy Director Tony Annan, who coached Carleton and Goslin at Georgia United before it merged with the new MLS team. “They’re entrenched in the first team. They have their own locker in the first team dressing room. Carleton scored a brilliant goal – a firmly struck 25-yard chip -- in the USA’s 6-2 win over Cuba clinched a U-17 World Cup spot for the USA. Also golazo-worthy was his 18-yard volley in the Concacaf U-17 Championship final against Mexico, which prevailed in a penalty-kick shootout after the 1-1 tie. Carleton assisted on goals in the 3-0 win over Honduras and in the 4-3 first-round win over Mexico. Goslin has been a key part of a U.S. midfield that dominated its opponents en route to the final. A third Atlanta United player, winger Zyen Jones, scored in the 1-0 win over El Salvador and against Cuba. A fourth Atlanta United player, Carlos Asensio, is in Bradenton residency but didn’t make the 20-man qualifying roster. Annon has coached Carleton and Goslin since they were 10. 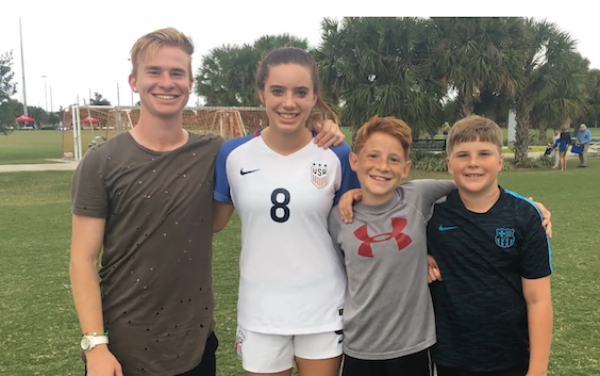 Andrew Carleton’s four siblings also play soccer: Erin (age 15) was called into U.S. U-14 girls national team camps in 2016; Alan (12) is a midfielder and John (10) a goalkeeper. Coco (13, not pictured) and Erin both play ECNL ball. Carleton and Goslin were teammates on the 2015 U-16 Georgia United team that was the only non-MLS club to reach the semifinals of the U.S. Soccer Development Academy at either age group. At a young age, Goslin stood out for his strength, power and quickness, says Annan. But when players progress to a higher level, more is required. Jones scored both his goals in qualifying after bursting past his marker. Georgia has produced stars before, such as Josh Wolff, Clint Mathis and Ricardo Clark. But the Atlanta area is now looking like a youth soccer hotbed. Atlanta United’s George Bello and Danny Mangroave played on the U.S. U-15 national team that won the Torneo Delle Nazioni, in Italy and Slovenia in late April. In addition to Atlanta United’s U.S. U-17 players, Indiana Vassilev, who scored against Cuba, hails from Savannah, Georgia, was the one of the youngest players on the qualifying roster, one of three 2001s. And two Georgia-born Atlanta United academy players played for USA opponents at the Concacaf U-17 Championship: Jamaica defender Kendall Edwards and Honduras defender Alex Bahr. Annan, who moved to the USA from the UK to play college soccer, has lived in Georgia for the past 22 years. “It’s come so far so fast,” he says. “The club system has grown exponentially. In the last 10 years, folks have really come to grips with the professionalism of the game. Our program is being fed by very well organized clubs in Atlanta. There’s some really good leadership at the clubs. Good organization. Quality coaches. Good clubs work with us. You’re seeing the fruits of that labor. 19 comments about "The Rise of Georgia -- young Atlanta United players making international impact". don Lamb, May 9, 2017 at 1:01 p.m.
Kumar - What were you saying about how horrible DA clubs and coaches are? The second to last quote from Annan says it all. don Lamb replied, May 10, 2017 at 10:33 a.m.
Yeah, because there's no evidence of it actually being the case. Players coming out of the Atlanta area left and right. I don't think it's because of the street soccer scene. Fire Paul Gardner Now replied, May 10, 2017 at 5:30 p.m. I posted a similar comment from Josh Sargent about the coaching he received in DA but Kumar ignored it. Fire Paul Gardner Now replied, May 11, 2017 at 11:16 a.m.
That has nothing to do with what we're talking about but thanks once again for the personal attacks. don Lamb replied, May 11, 2017 at 12:33 p.m.
You have been proven wrong in just about every one of your assertions -- from poor comprehension to straight up making things up. In fact, this player that you are praising now was on the Brazil team that the US dismantled in November that you said wasn't any good. As for your comment here, it has everything to do with culture and how the Brazilian culture creates development grounds at places like Flamengo, where this kid was since the age of five. Nothing about his story mentions "street football," although that certainly played some part since unorganized games are a big part of Brazilian culture. Vinicius was highly trained from a young age, just like most every other Brazilian prospect. Bringing that back to our player development... Are we close to Brazil? No. But the Andrew Carletons and Sargents and Pulisics and loads of others are showing that we are improving dramatically. don Lamb replied, May 12, 2017 at 11:23 a.m.
10 years from now we will have little to show for it when the last five years have brought unprecedented success? If you are correct, and "all Mls is interested in is selling tickets," it certainly has not hurt the production rate of talented American youth players. "What do I see in our system as opposed to five years ago?" Is that a serious question? Have you noticed the amazing progress that MLS academies have made over the last five years in infrastructure and players developed? Have you not noticed that DA products who have followed the same trajectory? There is new evidence that comes out on almost a daily basis that supports this progress. The latest evidence being the Schalke U19s led by three Americans. Two of those players developed in MLS academies, and one developed in a DA. Of the stars of the U17s, Sargent, Carleton, Garces developed in DAs; Goslin, Sands, and Lindsey in MLS academies. From the U20s that won CONCACAF, Glad, Lennon, and Saucedo (maybe the three best players) all developed in RSL's academy. It is widely accepted that it takes 8-10 years to develop a player to a top level. Considering that and seeing how the progress that just started within the last 5-10 years has accelerated significantly in the last couple, it is not a stretch at all to say that we are just now scratching the surface and ten years from now will be an even more fruitful time. don Lamb replied, May 12, 2017 at 3:17 p.m. I'm not going to give you a full bio on each of those players. The fact is they all came through MLS academies or DAs. If you interpret what I wrote as "nothing," than is just another grossly incompetent comprehension job by you. What is being implemented today? Well, the aforementioned MLS academies and DAs that have been having great success producing players the last couple of years are growing and reaching more players the preexisting ones are becoming more established and new ones are popping up. Quarterback TD, May 10, 2017 at 8:45 a.m.
don Lamb replied, May 10, 2017 at 10:36 a.m.
You haven't? You don't have to take that so literally. All he is saying is that the sport is a livelihood for professional players. The sooner young players realize that, the sooner they can get really serious about their own game and what it means to be a professional. Quarterback TD replied, May 10, 2017 at 12:06 p.m. So it's ok to generalize and say things like "he became a lawyer to legally steal money off the pimps and drug dealers to make a living" or "he became a politician to collect bribes to make a living" ? Something's does not need to be invoked negatively when dealing with professions. Is it really needed when I am sure 90% of the team may not even be playing pro for the reason mentioned. don Lamb replied, May 10, 2017 at 1:47 p.m. I don't follow your analogies. Since when is "putting food on the table," which is a symbol of honest hard work, analogous to "stealing money from pimps and drug dealers" or "collecting bribes?" Quarterback TD replied, May 10, 2017 at 3:48 p.m. Exactly my point but because you and your twin Fire are super small minded you will never understand. Both of my examples are legal hard honest work..lawyer is just working on behalf of his client in a legally represented system and the politician is just taking legal payment on behalf of a lobbyist this is a legal bribe. My point is the way it subjected the players it's was a very narrow minded approach. don Lamb replied, May 10, 2017 at 5:30 p.m. I'm sorry -- what is your point? It looks like you said that stealing money and accepting bribes are honest work. The point of the original quote was the youth players can learn a lot from veterans who have earned a living in the game because the perspectives of a player in that position is a lot different than a player a the very beginning of his career. Fire Paul Gardner Now replied, May 10, 2017 at 5:32 p.m.
Do you really think all lawyers do is "steal money off pimps and drug dealers?" Those are the only people that ever get legal representation? Quarterback TD replied, May 10, 2017 at 7:16 p.m.
Don you saying I take it too literally and you do not even know the meaning. Bottom line is not every job is clean cut as a matter of fact a lot of good jobs one needs to get their hands dirty. My point is the writer makes it sounds like soccers player in Atlanta are on the low end of the pole and need to play to feed his family and that may be far from the truth. Quarterback TD replied, May 10, 2017 at 7:34 p.m.
Fire, sorry cannot help you.. thinking out the box is something you should have learned as a child..
Fire Paul Gardner Now replied, May 11, 2017 at 11:17 a.m. If what you call "thinking outside the box" would cause me to say things like all lawyers do is steal money from pimps and drug dealers then I'm glad I missed it. Nick Daverese, May 10, 2017 at 8:16 p.m.
You guys have to get used to playing with men in the men's game at every level. We played our under 18 teams against my adult team in friendlies to get them used to the more physical game. We would put our under 19 team who won the state cup at under 17, under 18 and under 19 into the US open cup. For the experience I think the entrance fee was only 100 dollars. They would always lose early. Because of the more physical game and the opponents team captain. A good team captain in the adult game can get you an extra 4 wins in the course of a season. Craig Cummings, May 12, 2017 at 1:50 a.m.
What about Clint Mathis.Atlanta product? Now with Galaxay as tv commentater.